This article is about the Australian community. For the German mission, see Hermannsburger Mission. 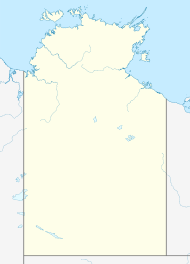 Hermannsburg is an Aboriginal community in Ljirapinta Ward of the MacDonnell Shire in the Northern Territory of Australia, 125 km west southwest of Alice Springs. Local Aboriginal people call it Ntaria. Hermannsburg lies on the Finke River within the rolling hills of the MacDonnell Ranges in the southern Central Australia region of the Northern Territory. At the 2011 census, Hermannsburg had a population of 625, of whom 537 (86 per cent) identified as Aboriginal. 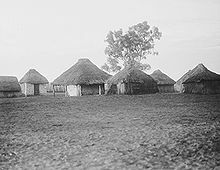 Hermannsburg was established on 4 June 1877 at a sacred site known as Ntaria which was associated with the Aranda ratapa dreaming. It was conceived as an Aboriginal mission by two Lutheran missionaries A. Hermann Kemp (sometimes spelt Kempe) and Wilhelm F. Schwarz of the Hermannsburg Mission from Germany, who had travelled overland from Bethany in the Barossa Valley in South Australia. They named their new mission among the Aranda people after Hermannsburg in Germany where they had trained. They arrived with 37 horses, 20 cattle and nearly 2000 sheep, five dogs and chickens. Construction began on the first building in late June 1877 made from wood and reed grass. By August a stockyard, kitchen and living quarters were also completed. They had nearly no contact with Aboriginal people in the first few months, although their activities were being observed. At the end of August a group of 15 Arrernte men visited the mission camping near the settlement. Realising that communication was difficult, the missionaries quickly learnt the local Arrernte language, developing a 54-page dictionary of 1750 words which was published in 1890. A third missionary Louis Schulze arrived in Adelaide in October 1877 accompanying three additional lay workers and the wives of Kemp and Schwarz. With the additional workers, five buildings were complete by December 1878. By 1880 at church was constructed with the assistance of Aboriginal labour and the first church service took place on 12 November followed by school on 14 November. The first Aboriginal baptisms took place and in 1887 as many as 20 young people were baptised. While the population fluctuated, there were always about 100 people living at the mission as pastoralism increased and racial issues developed. Hostilities escalated in 1883 during a drought which saw local Aboriginal people hunt wandering stock. Fried Schwartz left the mission in 1889 due to ill health followed by Schulze in 1891. Kemp lost his wife and child during childbirth and was himself suffering from typhoid so also left the mission in 1891. The settlement was continued by lay workers until Pastor Carl Strehlow arrived in October 1894 with his wife, Frieda Strehlow. Pastor Strehlow continued documenting the Aranda language and was involved with local people in Bible translation and hymn writing. In 1896 additional construction took place of a school house, which was also used as a chapel and an eating house. Severe droughts during 1897-8 and again in 1903 meant poor food production and an influx of Aboriginal people. The Strehlows left in June 1910 due to ill heath and were replaced by Leibler and later by teacher H. H. Henrich. The Strehlow's returned but left on 22 October 1922 when Pastor Strehlow contracted dropsy. He died the next day at Horseshoe Bend. The mission was without a missionary until Pastor Riedel arrived in late 1923 followed by Pastor Friedrich Wilhelm Albrecht on 19 April 1926 with his wife. They stayed until 1962. Drought stuck again in 1927 causing ill heath and scurvy. There was yet another influx of Aboriginal people and 85 per cent of Aboriginal children died during this time. A delivery of oranges was considered "a miracle". Albrecht was integral to the development of the Kaporilja Water Scheme which piped water from a permanent water hole six kilometres to the mission. It was funded in part by Melbourne artist Violet Teague and her sister Una and completed on 1 October 1935 to the screeches of "Kwatja! Kwatja!" (meaning water). Albrecht also developed various other enterprises such as a large vegetable garden and orchard, beef cattle ranching and a tannery. They also supported the development of the school of watercolour landscape artists, which became one of the special heritages of the Hermannsburg area. The language became known as Arrarnta in 1980. It is frequently referred to as Western Arrarnta. People understand that there are Eastern Arrernte people, Anmatjirra and other language groups in nearby areas. There has been a very long history of vernacular literacy in the community, beginning soon after 1877. The recent 'Western Arrarnta Picture Dictionary', published 2006, is just one publication in a long and rich tradition of reading and writing in the local Aboriginal language. The mission land was handed over to traditional ownership in 1982 under the Aboriginal Land Rights Act. The Hermannsburg Historic Precinct was listed on the Northern Territory Heritage Register on 19 May 2001 and on the Australian National Heritage List in April 2006. Peter Latz (1941 -) botanist grew up in Hermannsburg. Albert Namatjira (1902–1959) was born at Hermannsburg. He developed the ability to use his acute observation of the land to paint Western-style watercolours. Painting in this style came to be known as the Hermannsburg School of painting. Shane Nicholson visited Hermannsburg with long-time friend Warren H Williams, and the town was inspiration for his 2015 album Hell Breaks Loose which features a track called 'Hermannsburg'. Carl Strehlow's son Ted Strehlow (1908–1978) became a noted anthropologist and was initiated into Aranda customs. Warren H Williams (1963–present) is a traditional owner of Ntaria and is now a prominent Australian country singer. ^ a b Australian Bureau of Statistics (31 October 2012). "Hermannsburg (SSC) (State Suburb)". 2011 Census QuickStats. ^ a b Anna Kenny, The Aranda’s Pepa: An introduction to Carl Strehlow’s Masterpiece Die Aranda- und Loritja-Stämme in Zentral-Australien (1907-1920), Australian National University 2013 p.15. ^ Scherer, P.A. (1995). The Hermannsburg chronicle, 1877-1933. Tanunda, S.A.: P.A. Scherer. ISBN 0646247921. ^ a b c d Watson, Penny (1987). "Early Missionaries of Hermannsburg". Heritage Australia. 6 (2): 31–34. ^ Strehlow Research Centre. Alice Springs, N.T. : Strehlow Research Centre. 1993. ISBN 0724528210. ^ a b c d authors, Contributing; Lohe, M.; Albrecht,, F.W. ; Leske, L.H. Leske ; edited by Everard (1977). Hermannsburg: a vision and a mission. Adelaide: Lutheran Pub. House. ISBN 0859100448. ^ Petrick, Jose (2007). Kuprilya Springs: Hermannsburg & other things (1st ed.). Alice Springs, N.T. : Jose Petrick. ISBN 9780646478104. ^ "Hermannsburg Historic Village Precinct". Heritage Register. Northern Territory Government. Retrieved 17 March 2019. ^ "Australian National Heritage listing for the Hermannsburg Historic Precinct". Environment.gov.au. Archived from the original on 25 October 2012. Retrieved 25 December 2012. Leske, E (ed.) (1977) Hermannsburg - A Vision and a Mission. Lutheran Publishing House. ISBN 0859 10 044 8. Roennfeldt, D. and the community members (2006) Western Arrarnta Picture Dictionary. IAD Press, Northern Territory, Australia. ISBN 1 86465 069 9. Kenny, Anna (2013). The Aranda’s Pepa: An introduction to Carl Strehlow’s Masterpiece Die Aranda- und Loritja-Stämme in Zentral-Australien (1907-1920). Australian National University. ISBN 978-1-921-53677-9. JSTOR j.ctt5hgz6k.10. Wikimedia Commons has media related to Hermannsburg, Northern Territory.